In a league in which Ray Lewis can go from being indicted on murder charges to gracing the cover of Madden in a matter of five years, and Ben Roethlisberger can get accused of sexual assault twice and still primarily be known as a Super Bowl-winning quarterback, you’d think NFL analysts would be easier on a guy whose only downfall is excessive tweeting and celebrating. But no; in the NFL, Ochocinco can’t do anything right. 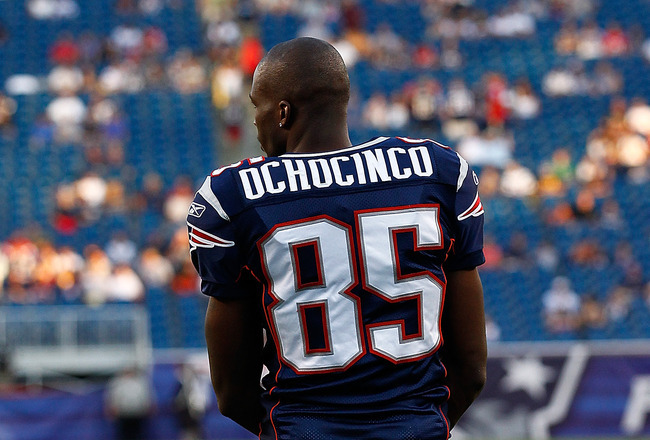 This off-season, after 10 seasons in Cincinnati, Ochocinco’s career-long wish was finally granted when he was traded to a contender, the New England Patriots. After spending time at voluntary workouts to improve his conditioning following the NFL lockout, Ochocinco looked primed to play a prominent role in the Patriots’ regular season opener. However, once game time hit, Ochocinco became an afterthought on the field. The one-time Pro Bowl receiver was thrown to three times and only came up with one reception for 14 yards. What’s amazing to me is how few people actually get Ochocinco. If people took a closer look at the man underneath the padding, they would realize just how unfairly skewed Ochocinco’s perception is in the league. After all, Ochocinco was the star of the Cincinnati Bengals for 10 seasons — the same Bengals that featured a 2006 roster with more player arrests than total victories. The same Bengals that became a haven for the NFL’s most troubled players. The same Bengals that won only four games in 2008, coincidentally the only season in which Ochocinco didn’t play every game since his rookie year in 2001.The same Bengals that, even after their reputation of being a team full of convicts started to fade, went out of their way to keep that persona by signing Terry “Tank” Johnson and Cedric Benson — two players that had serious arrests prior to getting multimillion dollar contracts from Cincinnati and continued their shady ways of life while playing for the Bengals. Benson just finished a prison sentence on Sept. 3 for assaulting a family member. After being selected in the second round of the 2001 draft, Ochocinco quickly emerged as one of the NFL’s top receivers. For four straight seasons, he led the American Football Conference in receiving yards. He made the Pro Bowl in six of seven seasons and was named an All-Pro for four straight years. By all accounts, from 2003-2007 Ochocinco was the most dynamic player in the NFL. When he deserved praise for staying healthy and productive for such a long duration, he received cynicism from analysts about whether he was really doing everything he could to help his team win. It’s not Ochocinco’s fault that he can’t impact a game as a wide receiver as much as a quarterback like Peyton Manning can. Yet somehow the Bengals’ lack of judgment became Ochocinco’s burden. While Ochocinco was dominating on the field and was omnipresent off of it, the negative perception of Bengals’ players around the league traced back to Ochocinco’s arrogant touchdown celebrations and tweets — not Ochocinco’s teammates’ DUIs and battery assaults. Considering Ochocinco’s visibility as the team’s star receiver, it was only natural for him to be associated with all of the Bengals’ troubles. After all, he did go out of his way to find the headlines by creating his own iPhone application, waltzing on “Dancing with the Stars,” creating his own VH1 reality TV show called “Ochocinco: The Ultimate Catch,” hosting WWE’s Monday Night “Raw,” trying out for Kansas City’s major league soccer team, racing a thoroughbred racehorse for charity, filming a cameo in the upcoming sequel to the “American Pie” series, and riding a bull in the Professional Bull Riding series. Still, none of these off-field ventures detracted from his performance on the field. When Ochocinco participated in a commercial or an event off the field, he was labeled a distraction to his team. When Peyton Manning filmed countless commercials and hosted “Saturday Night Live” around the same time, he was labeled a social genius. Despite Ochocinco’s reputation of being selfish, he has always been the opposite of “me first.” Ochocinco is driven by his goal to win a championship. When he held out of his contract in the summer of 2008, he wasn’t only doing it for the sake of making more money. Ochocinco was holding out because he believed the Bengals were giving up on their chase of a Super Bowl title. They hadn’t added any big-name free agents and seemed content to remain at their 2007 record of 7-9. On top of the lack of roster movement, the media had trashed Ochocinco in 2007, and yet not a single teammate came to defend him. Even when the Bengals didn’t trade him to a contender like he had begged them to do, he reported to training camp before the mandatory deadline and kept his mouth shut, handling the situation like a true professional. In an ESPN “Sunday Conversation” with Keyshawn Johnson in 2007, Ochocinco made it clear that he didn’t care about others’ perception of him in the league. Johnson told Ochocinco that he was considered a distraction to the team and that his antics on the field made him come off as more of an entertainer than a football player. Ochocinco refuted that notion, saying, “[I’ve] never gotten in trouble, never did anything wrong.” Unlike eight of his teammates in 2006, Ochocinco was not arrested. Despite all of the temptations of spending time with those teammates off the field and going around looking for trouble, Ochocinco resisted. Ochocinco, the same boy who gained his reputation of being a troublemaker from his childhood in south Florida, had matured to the point that he was inviting fans to dinners and movies through his Twitter page, and picking up the tabs for them after the events were over. When you look at Ochocinco’s antics on the field, it’s actually puzzling to realize he was the cleanest, most consistent Bengal during his tenure with the team. In 10 years with Cincinnati, Johnson only missed a combined nine games. Fast forward to last week, and it’s still evident that Ochocinco can’t shake his reputation. Ochocinco simply can’t win. He congratulates Tom Brady to assure his quarterback that he’s okay with his diminished role on the team, and he still gets ripped. Again, it’s not Ochocinco’s fault that he toiled away in Cincinnati for his entire career and never got to be a part of a truly professional team. When Bruschi says, “You still don’t understand it …” it’s probably more accurate to say Bruschi, and the rest of the football world, never took the time to understand him.